A friend called the other day to ask me about disk recovery specialists; I told him to call DriveSavers and that it wouldn’t be cheap. I told him he should know better and that recovering his disk was gonna cost him much more than a fullly-automated, redundant, fail-safe backup system and enough media to last the rest of his life. Hard disks die unexpectedly. Macs are stolen or destroyed. Lightning strikes. Heads crash. It happens and you could be next. 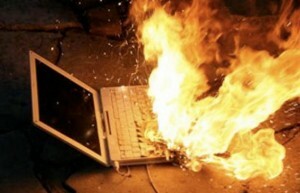 Which files would you miss the most if your Mac burst into flames and disappeared in a puff of smoke RIGHT NOW. When was the last time you backed up that file? So the last part of today’s tip is to burn a CD, DVD, ZIP, JAZ, tape, MO, or something with your most valuable and irreplacable files, and then store that disc (or tape or cartridge or whatever) anywhere but where your Mac is, prefereably in another building but at the very least, in another room. I have backup DVDs stashed in the playroom, more DVDs at my neighbor’s house, some CDs in my garage, and a FireWire external drive with a recent clone of both of my production hard disks in my safe deposit box at the bank. You can buy a lot of hardware, software, and media for what DriveSavers is going to charge you. If you need more incentive, visit the DriveSavers Web site (http://www.drivesavers.com). Don’t miss the Museum of Disk-asters and the Hall of Fame with love letters to DriveSavers from Sting, Barbara Mandrell, Clarence Clemmons, Jimmy Buffett, and more. I guess they can afford DriveSavers… can you? If you’re not protecting your files, I promise you’re going to regret it — big time — someday. So go ahead and burn one for the doctor… you’ll be glad you did. P.S. That’s it. I promise. That’s the last you’ll hear about backups from me this year.